It seems that you are a breed apart. For not only are you a participant in HackMaster, the single greatest game ever created and pursued by mankind, but you are also a GameMaster (GM) or you run a character who has survived the rigours of the dungeon long enough to have amassed a modicum of fame and experience as well as a tidy little fortune. Having made your way in the Wurld, you are undoubtedly eager to take the next step in your career. What better way is there to shout, "By the gawds, I made it!" than to acquire that most sought after of prestige symbols - your very own castle. Brook not the naysayers who would chide you for 'settling down' into a comfortable life of semi-retirement. Let them have their vagabond lifestyle. You deserve better! 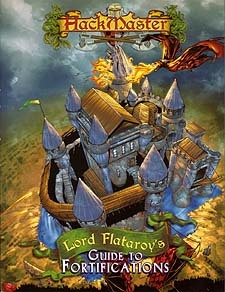 Lord Flataroy's Guide to Fortifications is designed for use with the HackMaster 4th edition game rules. This book focuses in on a specific style of game firmly entrenched in feudal society, including all the background information you need to make it sickeningly real.